When you think about empty gelatin capsules you probably would imagine a bland tasteless capsule about the size of a dime. Some may even not know what an empty gelatin capsules even is. Empty gelatin capsules are empty caps used to put herbs or health supplements into for daily or even infrequent usage. 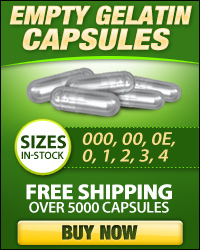 You may be surprised to find out that there is actually a large variety of different capsules available for sale online. There is a wide variety of flavored capsules such as bubble gum, strawberry and even bacon flavored gel capsules. Flavored caps are a fun novelty but there is also a more practical variety of gel capsules in different sizes so you can get a capsules suited for whatever you may be using them for. Why Use Different Empty Gelatin Capsule Sizes? You may wonder may one might need a much larger empty gel capsule for and why there would even be a market for it. Different sizes make it easy to get exact measurements for whatever herb or supplement you may be using. Empty gelatin cap sizes come in exact measurements so you can easily package herbs and supplements fast without having to worry about taking measurements or messing around with faulty scales. They also make other medicines much easier to take, for example elderly people may have issues with taking large supplement pills that have already been packaged. They could easily buy a quantity of small gelatin capsules and take their supplements in 2 or 3 small pills that will be easy to handle and not be a big hassle getting them to take it if that is the situation you happen to be in. Gelatin capsules are a great tool for anyone who lives a consciously healthy lifestyle or even people who just want to make their own lives or the lives of the loved ones around them much easier. Interested in finding a provider for empty gelatin capsules in a variety of sizes? There are websites online that specify in different empty gelatin capsule sizes and flavors to make all sorts of different situations easier. Do your research and read different reviews online and in magazines to find the best provider for empty gelatin capsules.